Sometimes the funniest line in a film can be completely off the cuff, and all the more hilarious for it. By now, Dave Bautista understands his character Drax inside and out, knowing just the sort of thing he would say under certain circumstances. Ever since we were first acquainted with Drax back in 2014’s Guardians of the Galaxy, one of his defining characteristics has been his utter obliviousness to various social situations. In an interview with Yahoo! Entertainment, Infinity War’s screenwriters Christopher Markus and Stephen McFeely revealed Drax’s most chuckleworthy line was completely improvised. Now, many of us left the cinema after Infinity War feeling emotionally wrecked. So Drax’s ability to lighten to the mood was super welcome. One of the many tense moments in the movie involved a showdown between Iron Man and Star-Lord on Titan, with each hero trying to weigh up the others allegiances. Then of course Drax weighs in and smashes the tension with a belter of a one-liner. What I usually do when I get a script is I read my dialogue first, I just didn’t really get the jokes. I just didn’t think Drax was that significant in the film [Guardians of the Galaxy: Volume Two], and I don’t find myself funny at all. So I remember reading, and I’m just sitting there not laughing. Like, wow, it was disappointing because I thought Drax was going to be so much more. When we sat down for the table read, is when it clicked. It clicked in my head. For one, I could hear everybody doing their own parts, and it was just so funny and deep, and some of it sad. But also, when I would say my lines and people would laugh, it would kind of start to make sense. It’s so funny, because we can a lot of times gauge our performance on James’ [Gunn] laughter off a set, or he gets very excited. He’s a very excited director. If he loves something, he’ll come running out and go, ‘Oh, my God! That’s great! That was great!’ Then walk back. Other times, we can just hear him at the monitors just laughing hysterically. And I’d start laughing bigger, and I could hear him laughing. The laughing would just get louder and louder. So a lot of times I gauge myself by his laughter or his excitement, which is great. thor: you’re pretty bad at listening. drax [blushing]: thanks for saying i’m pretty. 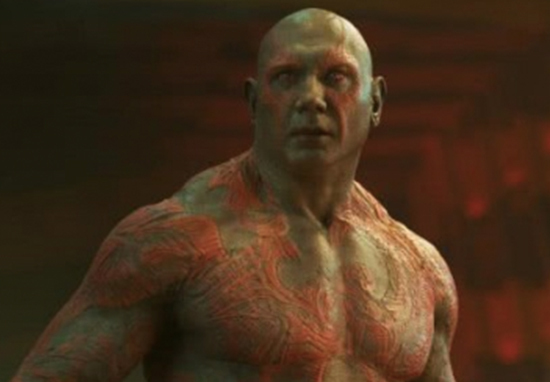 We all need a friend like Drax, who can stomp unwittingly into heated situations and lift the atmosphere.